The Auto Stack Core (Automotive Fuel Cell Stack Cluster Initiative for Europe II) cooperation project is a merger between 14 European auto manufacturers, suppliers, system integrators and research institutes. Working together, their goal is to develop a fuel cell stack (FC stack) for vehicle applications which satisfies the most advanced international aspirations in terms of performance, performance density, lifespan and effectiveness. On the basis of cooperation between these differing participants, the most optimum possible combination of the existing know-how should be achieved and the critical development interfaces coordinated efficiently. The Autostack precursor project, which was completed from 2010 until 2012 (FCH-JU GA 245142), served the purpose of developing shared specification requirements for the participating OEMs and a technical concept for their realization. The goal of this concept was to enable the installation in different vehicles and vehicle categories of differing manufacturers, and on this basis, to enable the achievement of far superior economies of scale during the initial marketing phase. The basis for this was provided by a detailed installation study, in which the available installation space in the different vehicles from the participating manufacturers was investigated in order to determine the volume and geometry of the target design as the basis for the shared platform concept. The additional framework conditions for the project constitute the use of components that can only be manufactured on an industrial basis with the necessary degree of maturity for the development of the stack, to enable a rapid transfer of the results into the industrial manufacturing subsequent to the completion of the development. In combination with an exceptionally high output density, the platform concept also aims to create the requirements for ensuring that the target costs for the use in vehicles can be realized as quickly as possible. 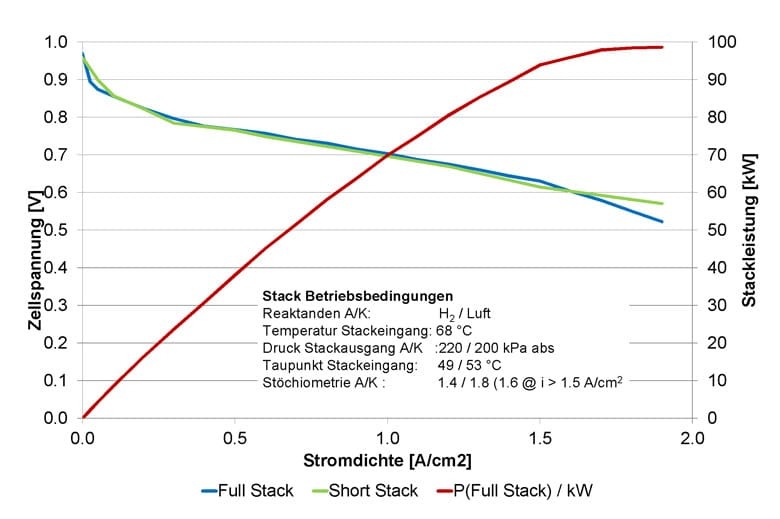 The scalability of the stack output of 10 to 95 kW also aims to create the requirements for the flexible use of the stack in other applications. In the scope of the project, the stack development progressed through the three following development phases, which are based on the development cycle in the field of automotive design: Prototype = Evolution 1, A-sample = Evolution 2 and B-sample = Evolution 3. The first two phases were accompanied by a complete test program which consisted of all of the standard functional-, performance-based, duration-based and environmental tests in order to demonstrate the technical realization of the goals and the potential optimization. Accompanying benchmark- and manufacturing cost analyses should also ensure that the specification is compared with the international development status and adapted accordingly, and that the design is suitable for attaining the target costs. At the end of 2014, following a development period lasting one and a half years, a total of 20 short stacks, each of which had ten and/or 20 cells, as well as a full stack with 331 cells, were available for the validation of the results. In March of this year, the test program for the prototype (Evolution 1) was successfully completed. The proven technical attributes correspond to the development goals for this phase in terms of all the key parameters (see tab. 1) and confirm the design concept. The stack stays robust within the specified operating conditions, is cold-start-capable at -20 °C and already has a very high output density with even more potential for improvement. The fact that the costs which are to be expected for the subsequent series manufacturing, and which have also been analyzed by external experts, are very close to the target level even in this early developmental phase, is especially pleasing. The tests also demonstrated an excellent concordance of the output data in the operation of short stacks and full stacks. The approach taken in the project, which consisted of an intensive cooperation between vehicle manufacturers, component suppliers, system integrators and research institutes, proved to be a success. The direct exchange of information and the shared analysis of the critical development tasks enabled an optimization of the cell and stack design as well as the faster and more efficient realization of the technical and commercial goals. The ongoing consultation with the vehicle manufacturers enabled the provision of direct feedback on the construction-based requirements. In comparison with the conventional development programs used in the automotive industry, it was therefore possible for the development results to be achieved with a comparatively modest budget. The consortium completed an analysis of the achieved level of development at the start of April 2015, and agreed to specific steps for the next phase of the development. Following the conclusion of the design phase for Evolution 2 (A-sample) and the completion of a comprehensive test program, a further design review is scheduled to take place. The development level that has been achieved and the considerable potential for improvement already allow the conclusion to be drawn that all of the key project goals can be achieved. The project has a total duration of 46 months and is forecast to be completed by the end of 2016. The expected level of development will then enable a transfer into industrial series manufacturing within approximately two and a half years. The series manufacturing of FC stacks for automotive use originating from European development and manufacturing will thus be a realistic option from around 2018/2019 onwards. The project will therefore close a critical gap in the German and European value added chain and also provide a substantial contribution to increasing the level of European competitiveness with an important technology of the future. The market launch of FC vehicles by Toyota and Hyundai was recently initiated. With these vehicles, some initial experiences have been gathered in the area of customer business, and the market response has also been tested. Other manufacturers are set to follow over the years to come. At the same time, the development of the H2 refueling infrastructure is being driven forwards in the leading key markets, although some time is required before large volumes of FC vehicles can be sold marketed appropriately. The developmental status and a sample construction of the stack prototype were presented at the 2015 Hanover trade show, and as hoped, elicited considerable interest with vehicle manufacturers and system integrators. Follow-up discussions have already been scheduled with some players. From the start of next year, it will be possible for A-samples to be supplied to vehicle manufacturers or system integrators for the purpose of testing and demonstration. AutoStack-Core therefore slots in very well in the wider context of the general technological developments. 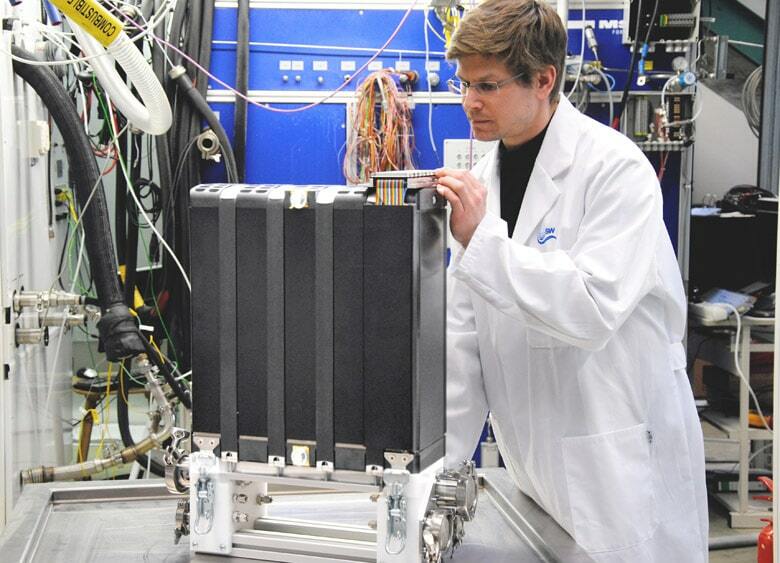 The consortium is ready to drive the future development of fuel cell propulsion systems forwards, and to support potentially interested parties with their development. 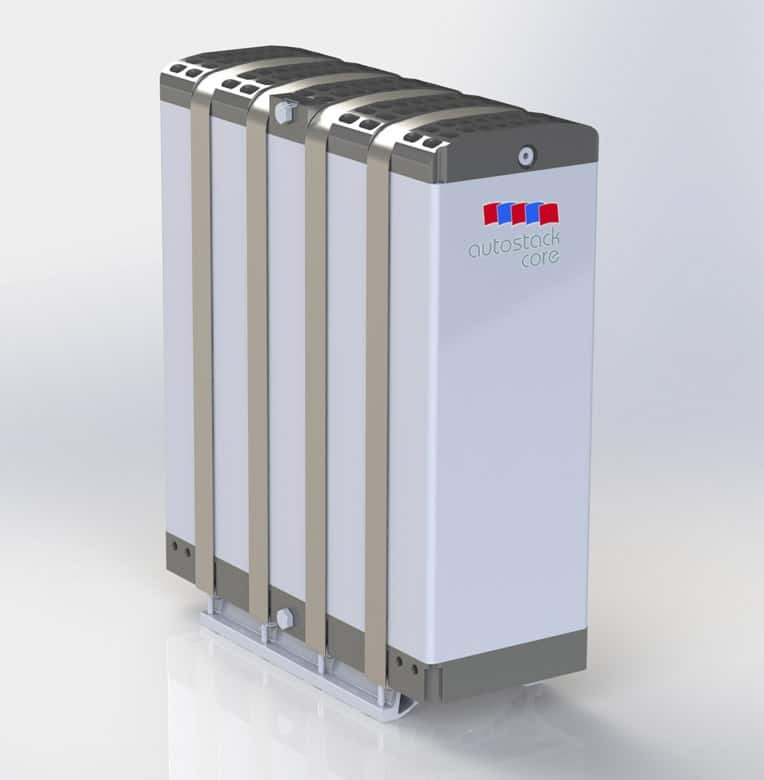 AutoStack-Core is receiving support in the scope of the European Fuel Cell and Hydrogen Joint Undertaking program (FCH-JU GA 325335). The participants include the auto manufacturers BMW, Volkswagen and Volvo as well as the supply firms Belenos, Dana, Freudenberg, PowerCell and Solvicore. CEA, Fraunhofer ISE, PSI and ZSW are also accompanying the project as research institutes.